Want to have a bird's eye view of the surfers at Mavericks? Well, here's your chance! We are the owners of Half Moon Bay Sportfishing and the Queen of Hearts, a 50 foot sportfishing vessel which operates out of our shop at Pillar Point Harbor, located right at the docks just a few minutes boat ride south of Mavericks. The Queen of Hearts is a Coast Guard inspected, certified and fully insured vessel and operation. We are one of the premier boats in the Bay Area, have an exceptional reputation, and have owned and operated the Queen of Hearts out of Pillar Point for over 25 years. We also work with several other experienced, Coast Guard inspected and certified 40 to 55 foot charterboats who we book for and work with to take folks to view Mavericks on the contest day. The way the waves come through at Mavericks, experienced boats can safely sit just outside the areas where the surfers sit and the waves start breaking. Always staying at a safe distance, we are still able to be right next to the surfers at times. From the boat, viewers can look right down the tube and get some awesome views of surfers shooting the curl. Folks onboard get to experience the roar of the ocean and at times feel the breeze hitting their face as the tube crashes, closes and spits. Just keep in mind, though, that being onboard a boat is not for everyone. Even though we are not shooting 30 foot plus waves like the surfers just yards away, we are riding the large swells that come through. Once the boat leaves the dock, it does not return until it's scheduled return time except for emergencies, and normal seasickness is not an emergency! 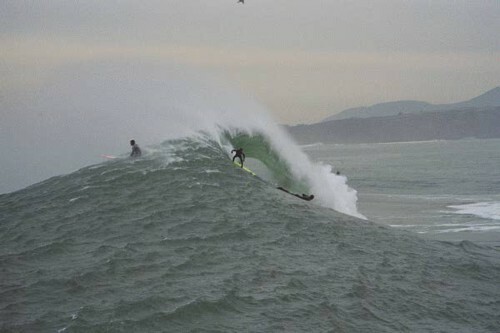 Captain Bob Ingles, owner/operator of the Queen of Hearts, runs the Queen of Hearts to view the surfers at Mavericks. Capt. Bob has operated charter boats out of the harbor for over 30 years, longer than anyone else currently running, and operated or decked on boats for over 45 years. He is also well accustomed to shooting the breakers: he grew up on boards and boats in Southern California, fished for striped bass by backing 50 and 60 foot boats in the breakers along the beaches between San Francisco and Pacifica back in the 70s and 80s, and makes his living now primarily fishing shallow water along the San Mateo coastline. He is able to share his knowledge of the area with the charterboats who work with us on the contest day. The trip is not cheap. But there is absolutely no better way to check out the action short of being in the water. Those that say otherwise don't have a clue. SIGN UP HERE: Click here to sign up or our shop's Mavericks e-mail group for Mavericks-related updates including when our system is open for Mavericks trips reservations! At this time we have lots of room for our trips! Why? We have been booking and running boat trips to Mavericks longer than any other business. We don't take advance reservations for our Mavericks trips until we are fairly confident the contest is going to take place, as the trips usually book up with no problem as soon as we know the contest is going to take place given that we are the only brick and mortar boat booking company located at the harbor in Half Moon Bay. That helps reduce need for refunds, cancellations and the hassles of scheduling difficulties for everyone, and we're not needlessly holding folks' money until the appropriate time. Those who really want to go on our trips usually have no problem getting a reservation as long as they act promptly. We generally get a good idea when a swell with contest potential is heading our direction and will try to send out a heads up notice if at all possible. When the timing is right, we'll open up our online reservation system and blast out an email to let those on our list know to hop on their computer and grab their spot(s). The reservation system is a first come, first serve operation to be as fair as possible to everyone involved. Reservations will require payment in full at the time of booking and are non-refundable unless the contest does not take place. We book for three boats from our shop, and once we fill our boats, our lease with the harbor allows us to bring in and work with other boats as needed depending on customer demand. All our boats and the boats we work with are Coast Guard inspected, certified, licensed and insured commercial passenger fishing vessels owned and operated by captains with literally decades of experience on the ocean and with running trips to Mavericks. No one knows when or if the contest is going to take place until the ocean conditions are right. The contest waiting period is open this season through the end of February. Generally there are black out dates around holidays where the contest won't be called because of inability to coordinate with the various entities and organizations involved. If you hear something about the contest going to take place and you haven't heard from us, feel free to get in touch with us for an update. We're pretty good about keeping up with what's going on with Mavericks...our shop is right next door to Jeff and Cassandra Clark's Mavericks Surf Shop...but there's always that chance you may hear something before us. We will do our best to give notification of the Contest to those on our email list as soon as possible once the call is made that the contest is on, hopefully at least three days before the contest date, but it is very possible that notification might not be received until as little as 24 hours prior to the Contest. There is no way to know exactly when the contest will take place. There is no exact date. There is no exact time. The only thing we know is that the horn will blow and the contest will go off if conditions are right sometime after daybreak early morning one day and one day only sometime during the contest waiting period which runs from November 2018 through March 2019 this season. The organizers watch the weather forecasts and when things look right, they give it the green light. Notices will be blasted out as soon as possible no later than the day before the event. For a previous contest, word started circulating early in the morning that the contest was on for the next day. Sometimes, though, we can get a feel for things and know when there's a possibility that it may happen and also when it's not a few days in advance. 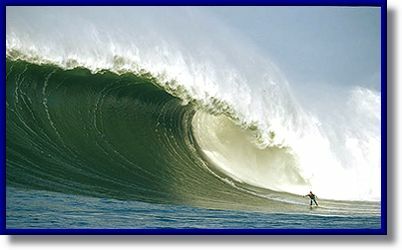 There may be outrageous Mavericks days when the surfers go at it, but there is only one contest day. We book for up to eight boats on the contest day and will offer at least two trips, just as we have done the past several contests, giving each trip as much equal time on the water to view the contest as possible. The first trip typically departs no later than one-half hour before the time the contest is scheduled to begin and will return sometime around the end of the third heat. The second trip will depart in time to view as much of the two semi-finals heats as possible as well as the final heat. With the addition of three heats for the women's field, there may be a slight change yet to be determined. The charge is $290 per person per trip plus a $10 per seat non-refundable booking fee. For those who would like to join us for both trips, we are no longer able to offer a discounted "both trips" price due to the extreme demand for this very limited event; just make two bookings, one for the first three heats and one for the semis and final. If you'd prefer to come to our shop and pay by cash, cashiers check or money order, give us a call at 650-728-3377 between 8am and 3pm and we'll see what we can do to accommodate you. Reservations are not confirmed, however, until payment is received; again, we will not hold spots without payment. Reservations cannot be cancelled once confirmed and are non-refundable, unless, however, the Queen of Hearts and/or other vessels are unable to provide the trip on the date of the Contest due to unsafe ocean conditions or any other circumstance which may prevent the boats from operating on the Contest date. The tickets are, however, transferrable, provided you speak with us and make arrangements to let us know who will be taking your place prior to the date of the contest. In the event the Contest does not take place, all prepaid reservations will be promptly refunded at the end of the contest waiting period less the non-refundable $10 per seat booking fee. For those with reservations, additional information will be emailed to you prior to the contest with as much detail as possible about the trip, directions, parking, what to bring, etc. There is no other way to offer reservations than the "first come first serve" method. If our trips fill up, which they have done for most if not all contest days, we will put folks on a standby list. There's always the possibility that one of those with reservations might not be able to make it when the day of the contest is announced. So there is a chance of standbys making it onboard. If you're interested in being put on the list for spot(s) that might open up, e-mail us and let us know. You may hear about others who will try to offer trips. Just keep in mind -- you get what you pay for! The 50' Queen of Hearts is one of the best maintained boats in the Bay Area. She is clean and one of the most stable boats in her class. Her captain (my husband) is Bob Ingles. Bob has run more trips out of Half Moon Bay over the past 30 years than anyone else currently running and noone knows the San Mateo coastline and reefs better. He is one of the few captains in the Bay Area and the only captain currently running out of Half Moon Bay who ran striped bass trips along the beach where they back the boats into the surfline, closer to shore than the surfers themselves, and shoot the breakers, backing down or gunning ahead to meet the oncoming waves properly. 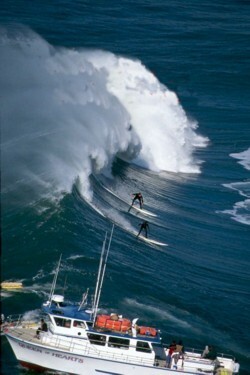 Shooting the breakers at Mavericks on a boat requires almost as much skill as it does on a board. The right equipment and experience can make all the difference, and we offer both onboard the Queen of Hearts. Last but not least, we operate out of Pillar Point Harbor, conveniently located just a stone's throw next to Mavericks, so customers simply board our boat right at our dock and have a short boat ride to get to the contest viewing area. Capt. Bob's experience and those of the boats working with us offering Mavericks trips cannot be matched. Non-contest days: We typically offer three hour trips for $100 per person. The trips will more than likely be scheduled for 8:00 a.m. and 12:00 noon departure depending on demand, but it may vary depending on swells, tides, etc. Exact pricing and timing may vary slightly depending on conditions and will be nailed down before we start taking reservations. We'll watch the reports and keep our ears open for news, and when it sounds good for surfing, we'll run a trip. We'll try to get an e-mail out as soon as possible, hopefully a couple of days beforehand. At that point, we'll take reservations on a first-come, first serve basis. A lot of you have better contacts in the surfing world than I do, so any news you can pass on will be greatly appreciated. If you hear of any plans or see a good swell on the horizon, please let me know. Private charters: If anyone's interested in a private charter for your own group FOR A NON-CONTEST DAY, just let us know. All we require is a 12 person minimum at $100 per person and the boat is yours for three hours (sorry, offer NOT valid on contest days). If you have more than 12, just add $100 for each additional person. The Queen of Hearts is licensed for up to 39 passengers.